Warm greetings to my readers! It’s been quite a time since I have updated my blog. Apologies! Well, with that being said, I want to update you guys that last month, 21st September marked Catch Themes’ 6th Anniversary. I feel extremely jovial that something I started with so little has grown so much and is marking its 6th birthday in the industry. I’ve had a great time working with my team in these past six years. Both my team and I have grown so much professionally and personally. I am extremely proud to have a team that has always had my back and am very happy of all our accomplishments in these six long years. So, for all those hard works put in by my team and me, we celebrated the delightful day in a delightful manner. On Friday, 21st September, we all gathered at Black Pepper Restaurant and Bar in Jhamshikhel, Lalitpur. It was a perfect and cozy place to have a small gathering and celebration. The music and atmosphere were amazing as well. I invited everyone from my Catch Themes team and also the managers of Acclaim Technology. It was a small yet blissful celebration followed by a cake ceremony. We all had a great time with food, fun and lots of photo sessions. Apart from all the excitements, the most interesting part of our celebration was the involvement of Fun Photo Stations, an amazing photo booth to take photos with your friends and colleagues. Fun Photo Stations is a project initiated by my very own friend and brother-in-law, Sunil Karmacharya. Fun Photo Stations provides charismatic themes, exciting props, and interesting photo frames to your photographs. So basically, Fun Photo brings a smile to everyone’s faces and adds that extra charm on your events by engaging the guests. You can know more about this amazing photo station here. 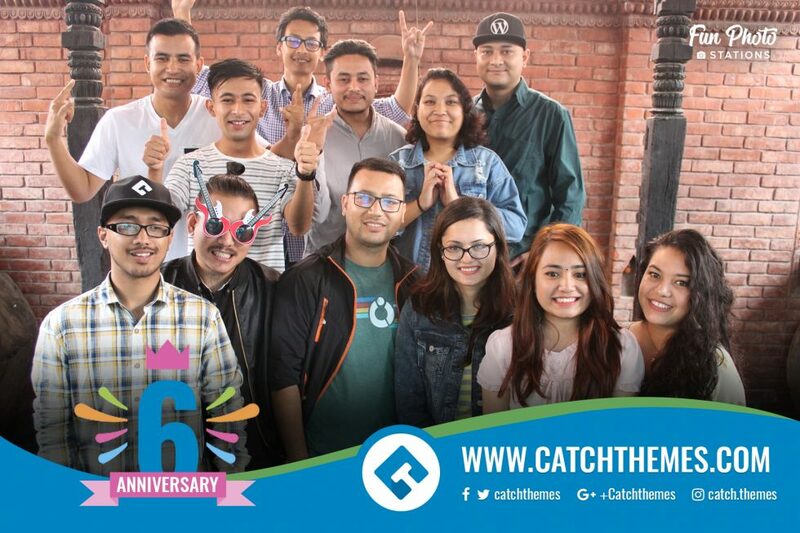 This 6th anniversary celebration has provided me a new and refreshed energy to build my business more and take my amazing Catch Themes team forward. Lastly, I want to thank everyone; my teammates and supporters who have always been there with me through all the thick and thin, and helped Catch Themes reach where it is today. Catch Themes is growing and collecting loyal customers from all over the globe. This is all because of you guys, so a big Thank You to everyone. I look forward to having your support in the coming days as well. Furthermore, I also want to update you guys that I went on another adventurous journey with Theme Palace team last week. I will be updating about that in my next post. So until then, keep spreading love. This entry was posted in Events, Life by sakinshrestha. Bookmark the permalink.